A criminal background check conducted by your local police service offers the most comprehensive approach to ensuring public safety. 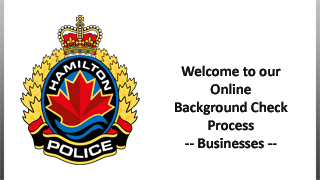 Police Services, like the Hamilton Police, are able to survey and provide additional information not included in third-party criminal background checks that might only reference the federal RCMP CPIC database. Additional information may exist, including criminal convictions for offences not supported by fingerprints (and therefore do not reside in the RCMP database), as well as potentially relevant non-conviction details including investigations where charges were not laid, charges that did not lead to convictions, and non-criminal offences such as disputes and disturbances. This information, if present, may be disclosed within a Criminal Record and Judicial Matters Check (CRJMC) (formerly Police Information Check) or Vulnerable Sector Check. While some third party companies offer faster results, you may not be getting as much information as might potentially be available. Be informed and aware of limitations that may exist. For a comparison of the reports currently offered, please click here. Applicants with a criminal record?